Do I have time for just one more Super Bowl recipe? Pretty please? 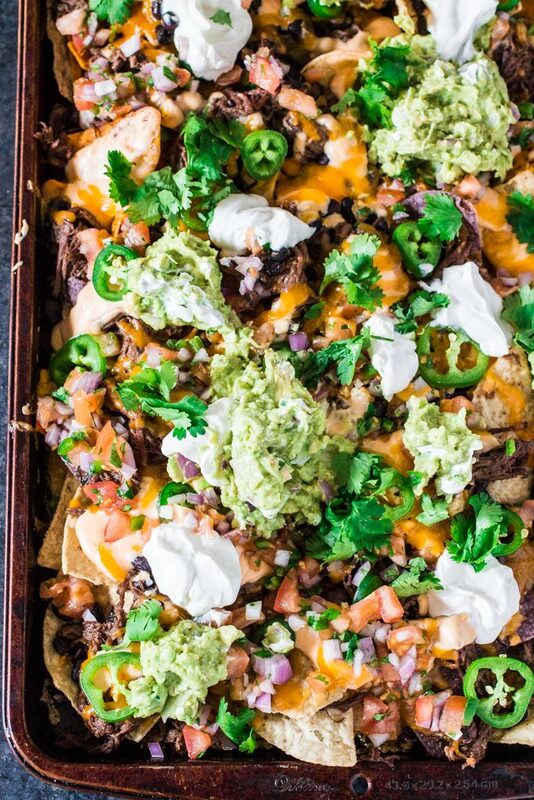 I’m especially proud of today’s recipe, because who doesn’t dig some fully loaded nachos? Especially when it involves 3 different type of tortillas, chipotle beer shredded beef, black beans, cheese sauce, more cheese, pico de gallo, fresh guacamole, jalapeños, cilantro and Mexican crema! Phew! I couldn’t say that in one breath even if I wanted to. So, yeah, these are definitely not your everyday “everything from a can” nachos. They do require a little work, but they are SO WORTH IT! Nachos have always been my favorite bar food. So it was a no brainer that I had to come up with some sorts of nachos to serve on Super Bowl Sunday. True, I don’t care for football and don’t even know which teams are playing this year – oopsie! – but I take my football food very VERY seriously. After all, the food is the only reason I’m not hiding in the bedroom, binge watching Netflix on my laptop, while my American husband and friends gather around the TV. 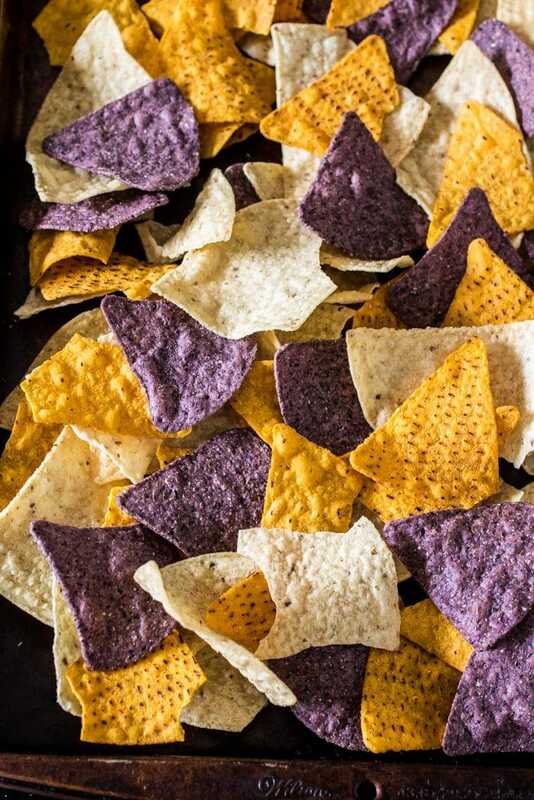 My secret to nacho perfection? Layering! Because there’s nothing more frustrating than sad chips with no toppings. And since we are talking about chips, I love my nachos plate to be very colorful, so I went with three different kind of chips here. Regular, sweet potato and blue tortilla chips! But the truth is, good nachos are all about personal preference. So feel free to use whatever kind of chips you love and to substitute or omit everything else! Except, please make the Chipotle beer shredded beef and the cheese sauce. They are really amazing and what make these loaded nachos platter the BEST ever. And, finally, my last two cents on nacho making is: Serve your nachos immediately after baking and assembling them. As much as I love nachos, there is one thing I won’t touch: soggy nachos! Start preparing the shredded beef the night before you plan to serve your nachos. In a large skillet, heat the olive oil, over medium high heat, until hot. Add the chuck roast to the skillet and brown on all sides, 5-8 minutes. Transfer the roast to the slow cooker and add the remaining ingredients. Cook on low for 8 hours. Once cooked and tender, remove the beef from the slow cooker into a cutting board. Using two forks, shred the beef. Reserve until ready to use. In a medium bowl, combine all the salsa ingredients. Refrigerate until ready to use. Add the grated cheese to a large bowl and sprinkle the corn starch. Toss to combine. In a saucepan, heat the evaporated milk until it begins to simmer. Add the cheese and stir until the cheese is melted. Then, add the cream cheese and the hot sauce and continue stirring until the sauce is thick and smooth. In a medium sized bowl or molcajete, add the avocado pulp and the lime juice. Add salt and, using a fork or potato masher, mash the avocado until the desired consistency. Fold in the onion and garlic. Reserve. Layer 1/2 of the tortilla chips on a large baking sheet. Then add 1/2 the shredded beef and 1/2 the black beans. Drizzle with 1/2 of the cheese sauce and sprinkle 1/2 the grated cheese. Top with the remaining tortilla chips, then shredded beef, beans, cheese sauce and grated cheddar. Bake for 5-10 minutes or until the cheese is melted. Top with the Pico de gallo salsa and drizzle the Mexican crema (**). Add the sliced jalapeños and cilantro leaves. Finish off by adding the guacamole. Gahhh, these nachos look AMAZING, Olivia!! I totally want to reach through my screen and steal your entire pan! Gimme! Love the chipotle beer shredded beef! So much YUM going on here! Cheers, chicka! Oh wow these nachos look amazing! I bet they were gone in minutes during superbowl! Nachos!? Yes please! I just want to gobble up this post. Looks so so good! A special and perfect recipe for saturday evening snack! This turned out great! Used a bottle of Pacifico beer. Good amount of heat from the chipotle peppers. I will definitely make this again. Tasted great wrapped in Napa cabbage or with blue corn tortilla chips. Thanks for the recipe!